For 'round-the-clock access to all cases contained in our publication of federal filings. Your personal password to FLW Federal Online is as little as $10.50/month if your office maintains a full-price subscription to FLW Federal. Access all cases filed by the U.S. Supreme Court and the U.S. Court of Appeals, Eleventh Circuit, using our database which extends back to early 2001.
Review cases from the U.S. District Courts and the U.S. Bankruptcy Courts in Florida*. Scan through our headnotes which help you quickly decide if the case is relevant. Make use of our fast search tool, which provides you with case subject matter with your hits. Turn to our subject-matter indexes when you want a handy, at-a-glance listing of subjects you can find quickly, including links to decisions. Build your in-house library of federal court decisions with our organized print publication. 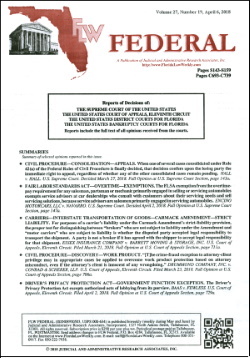 FLW Federal is published biweekly (weekly during the months of May and June) in the same format as The Florida Law Weekly with the emphasis on reporting the cases as quickly as possible after they become available. The full text of opinions is published with headnotes and a comprehensive subject matter index. Binders and periodic cumulative indexes are furnished. *Decisions of the United States District and Bankruptcy Courts are not routinely distributed to publishers as are those of appellate courts. We are requesting that the district court judges furnish us any written decisions or orders which they deem to be of sufficient importance to warrant publication.